Being mindful about how you get around can help make sure everyone gets home safely, whether you’re walking, biking, rolling, or driving. During dark times of day and wet weather, visibility is limited and changing road conditions make it harder to see each other. happen between 3:00pm and 6:00pm from October – January. Watch for other road users making unexpected moves. Make eye contact with other road users, if you're able. If you can’t make eye contact, assume they can’t see you. Be aware of your surroundings. Remove your headphones, put away your mobile device or other distractions. Always check that the intersection is clear and that other road users see you before proceeding. How to help cyclists and drivers see you. If there are no pedestrian crossing lights, wait until it is safe to cross. Jaywalking is illegal. Do not start to cross when the timer has started or the red hand is flashing. Crossing at this time is illegal. Add a reflector to your bag. Consider carrying a flashlight or flashing red light at night. How to help pedestrians and drivers see you, and stay safe. Use a white headlight and a rear red light and reflector on your bicycle after dark, when it's foggy, or when it's raining. Yield to pedestrians at all crossings. Wear bright or reflective clothing to be more visible at night or in darker conditions. Use designated bike lanes and routes when possible. If riding on the road, ride at least one metre away from parked cars in a straight line. Bike at walking speeds or dismount in crowded spaces. Walk your bicycle on a sidewalk and through crosswalks unless otherwise posted. The speed limit on shared pathways such as the Seawall is 15 km/h. 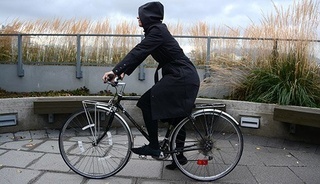 How to help pedestrians and cyclists see you, and ensure all road users stay safe. Do not drive, park, or stop in a designated bike lane. Watch your speed and drive slower. The speed limit on local street bikeways is 30 km/h. Watch for and yield to people walking and cycling at intersections and when making a turn. Scan the crosswalk and sidewalk corners to make sure people are not crossing or about to step out in front. Take extra caution when turning across a bicycle lane or pulling over to the side of the road, and always yield to bicycles. Keep at least three seconds of following distance behind people cycling and at least one metre of space beside people cycling. Know the hand signals that people cycling use to indicate they are turning left, right, or stopping. Only honk your horn at a person on a bicycle if you need to give them a warning. A loud honk can be startling and cause someone to fall. Use this VanConnect form to request traffic or pedestrian signal changes, additions, and repairs. Use this VanConnect form to request sidewalk repairs in the city. Use this VanConnect form to request sign repair in the city.